When I joined the Bo Sanchez Membership Site, I become more interested on news and blog related to business, stock market and personal finance. 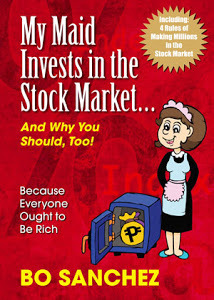 Though TRC is also sending us materials about business strategies, personal finance, Philippines stocks update, etc. I still make sometime in a given day that I check the news related to what are happenings and updates on business matters, specially in the Philippines. 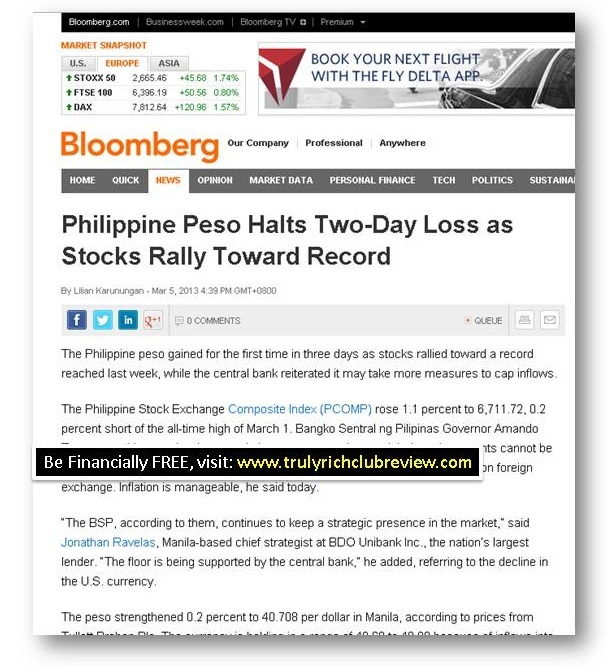 You may also read this news related to Stock Market in the Philippines. This is Bloomberg.com, a premier site for business and financial market news. It delivers world economic news, stock futures, stock quotes, & personal finance advice. The Philippine peso gained for the first time in three days as stocks rallied toward a record reached last week, while the central bank reiterated it may take more measures to cap inflows. The Philippine Stock Exchange Composite Index (PCOMP) rose 1.1 percent to 6,711.72, 0.2 percent short of the all-time high of March 1. Bangko Sentral ng Pilipinas Governor Amando Tetangco said yesterday that a cut in interest rates on its special- deposit accounts cannot be ruled out as it seeks to “encourage outflows,” and signaled he may loosen rules on foreign exchange. Inflation is manageable, he said today. “The BSP, according to them, continues to keep a strategic presence in the market,” said Jonathan Ravelas, Manila-based chief strategist at BDO Unibank Inc., the nation’s largest lender. “The floor is being supported by the central bank,” he added, referring to the decline in the U.S. currency. 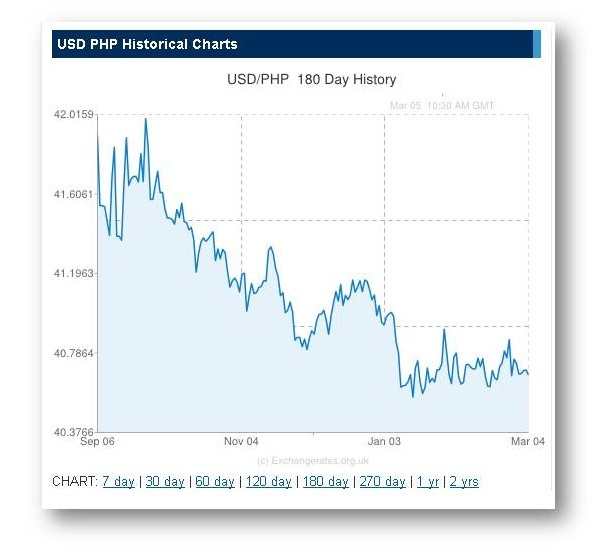 The peso strengthened 0.2 percent to 40.708 per dollar in Manila, according to prices from Tullett Prebon Plc. The currency is holding in a range of 40.60 to 40.80 because of inflows into shares, Ravelas said. One-month non-deliverable forwards rose 0.1 percent to 40.72 per dollar, a 0.03 percent discount to the spot rate, data compiled by Bloomberg show. Implied volatility, a measure of expected moves in the exchange rate used to price options, dropped two basis points, or 0.02 percentage point, to 3.95 percent. Overseas investors bought $812 million more Philippine stocks than they sold this year through yesterday, according to exchange data. The benchmark share index has climbed 15.5 percent since Dec. 31. Policy makers cut the interest rate on about $44 billion held in the special-deposit accounts in January to 3 percent from more than 3.5 percent. Consumer prices rose 3.4 percent last month from a year earlier, after a 3 percent advance in January, the National Statistics Office reported in Manila today. The median estimate of 16 economists in a Bloomberg survey was 3.3 percent. The yield on the 6.125 percent government bonds due October 2037 fell 12 basis points to 4.78 percent, according to prices from Tradition Financial Services.